From igniting a fire during camping to lighting the candles on a birthday cake, matches are an essential part of our life. Sometimes, we take everyday things for granted and underestimate the beauty of the production process and the science of it. While our ancestors used to rub rocks to create a spark, we instantaneously set a fire going using a small wooden stick topped with chemicals. 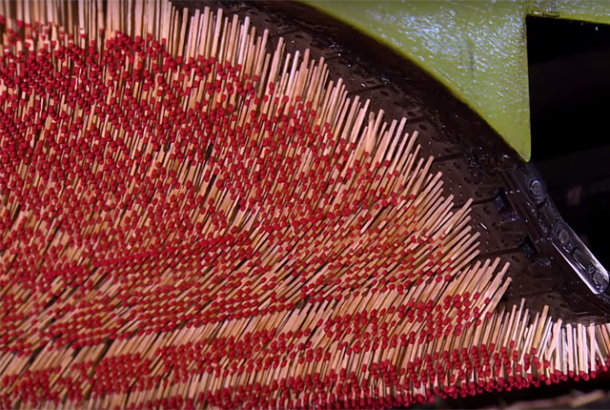 The YouTube channel, “the Science channel” visited a match factory to find out how the matchsticks are made. A large mix of potassium chlorate, silica granules, and gelatin is cooked in boiling water to prepare the mixture for the matchbook heads. A massive, industrial-sized machine then organises and packages matchsticks. The efficiency of the entire production process is awesomely impressive!